The European Commission has said it is "in close contact" with the Irish government over its decision to guarantee all bank deposits. Concerns have been raised that Dublin's move may give Irish banks an unfair advantage over foreign competitors. The commission has also called for stronger central supervision of government-led guarantee schemes. Separately, the EU has cleared the UK government's nationalisation of British bank Bradford & Bingley. The Irish government said on Tuesday that it would safeguard all deposits, bonds and debts in the Republic of Ireland's six biggest banks and building societies for two years. The institutions covered are Allied Irish, Bank of Ireland, Anglo Irish Bank, Irish Life and Permanent, Irish Nationwide Building Society and the Educational Building Society. With the scheme also covering any of the institutions' branches in the UK, some opponents of the move say it will unfairly make the Irish banks more attractive than their British counterparts. 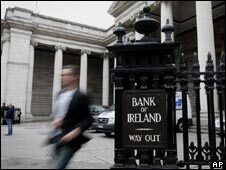 The British Bankers' Association said that Ireland's move had put British banks - at a competitive disadvantage. "The extent of the guarantee has clear consequences for firms competing to win retail deposits," a spokesperson said. European Commission President Jose Manuel Barroso said Europe needs stronger central supervision of government-led deposit guarantee schemes such as that in the Republic of Ireland. Competition Commissioner Nellie Kroes' office also said on Wednesday that it will investigate the state-led bail-out of German bank WestLB. In April the EU approved a 5bn euro ($7bn; £4bn) bail-out to the bank led by the state of Northern Rhine-Westphalia. The EU said it would now review this decision.